Another look. 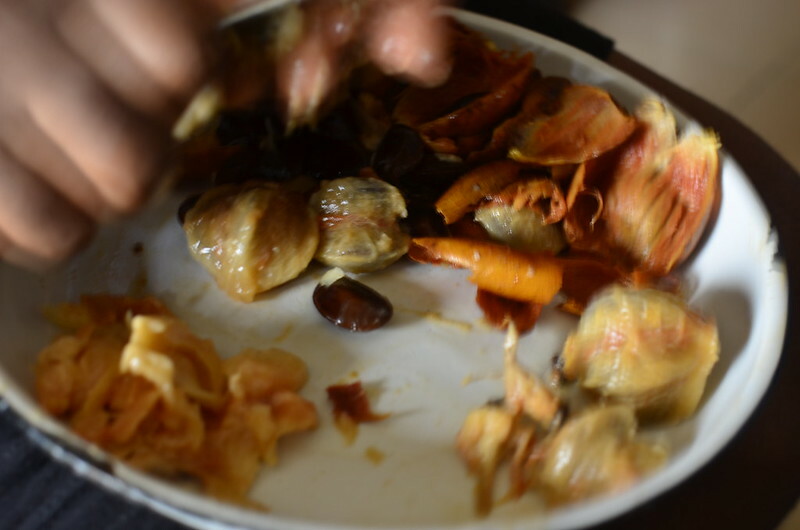 Consider this the follow-up to The Anatomy of Agbalumo post. 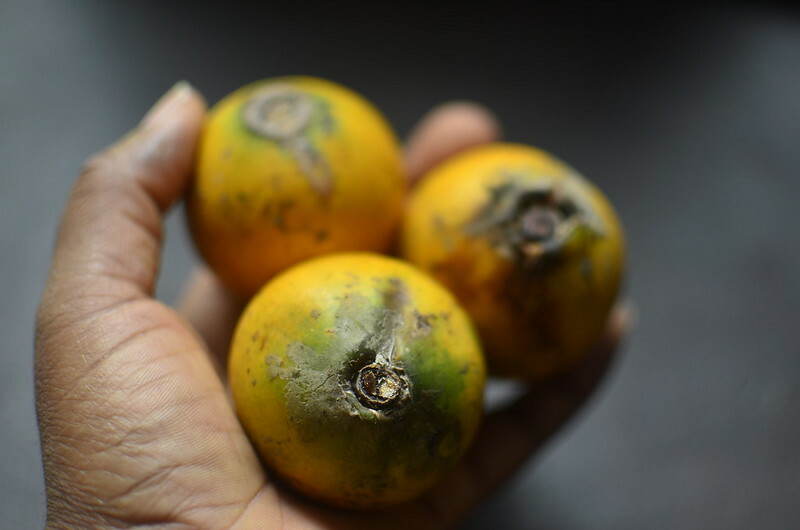 In the last few months, I’ve learnt more about agbalumo than I ever though, from its versatility as an ingredient to its nutritional qualities, its provenance across West Africa from Nigeria to Ghana, where it is known as Alasa, Alansa, Adisaa in Twi. The sweetest ones I’ve had are the ones I got this week – red-fleshed, huge and soft to the touch. Really juicy and from Benin Republic. These are the ones I used them in my Agbalumo liqueur. Udara. 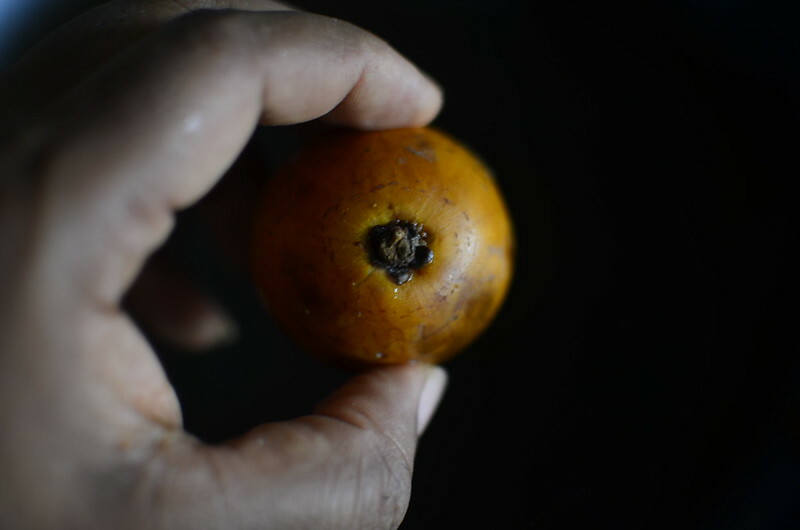 Agbalumo. White star apple. Chrysophyllum albidum. African star apple, of the familySapotaceae. The head, where the stalk sits bears a ‘flower-pattern’ cap which reminds me of the larger one on the purple mangosteen. 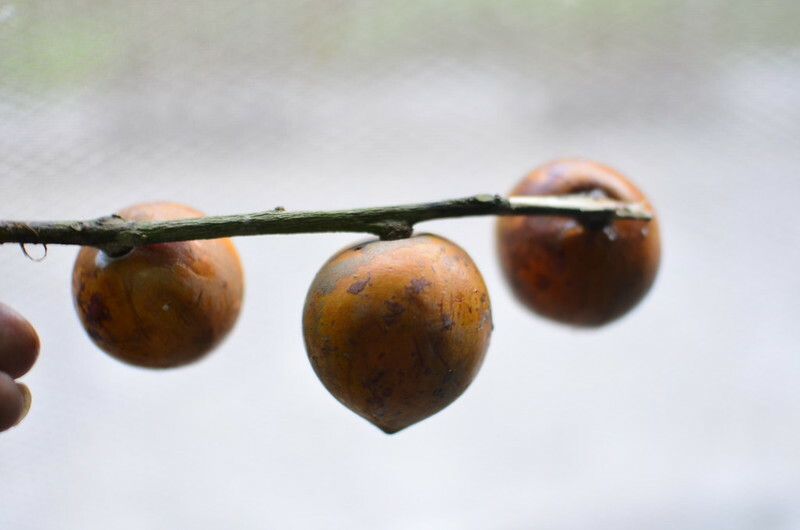 Unripe agbalumo is green around the stalk. The fruit will be very sour and tart, compared with ripe ones where the flesh is all orange, particularly around the ‘head’. Chrysophyllum is a group of trees in the Sapotaceae described as a genus by Linnaeus in 1753. The genus is native to tropical regions throughout the world, with the greatest number of species in northern South America. One species, C. oliviforme, extends north to southern Florida. Most agbalumo I enjoyed, worked with this season weighed between 50 and 120g, up to half of which is the weight of the seeds. A typical 50g fruit is about 5g skin, 15g flesh and 30g seeds. …,which can also be seen when the head of the fruit is pressed together to open it up, usually for sucking. Sometimes, the latex escapes before the fruit is ‘open’, and ends up dried around the stalk and skin. 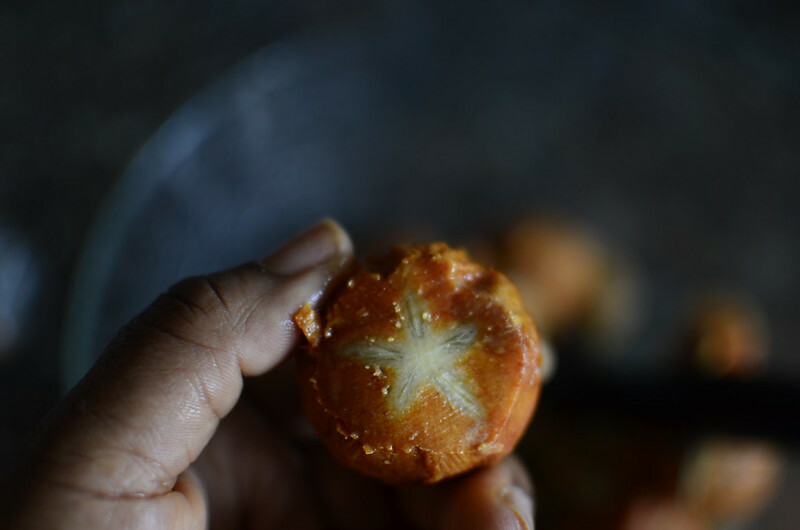 Futhermore, when you slice, the star pattern of the agbalumo is revealed – the source of its star apple name. 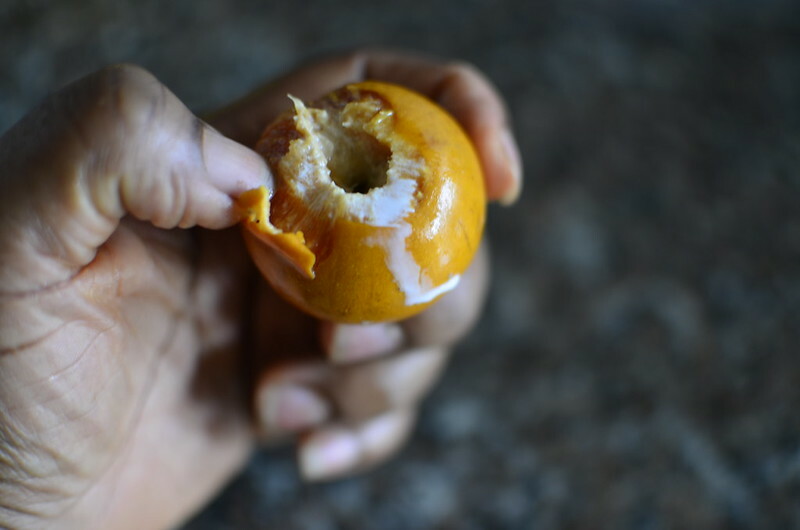 Because of the amount of latex in agbalumo, I advise using glass bowls as ‘holding containers’ if stripping the fruit down. I’m not sure how the acid in it reacts with metal, so I won’t give that recommendation for storage. I find the latex collects on the inside of plastic containers and is quite difficult to get off. This is also the case when processing it. 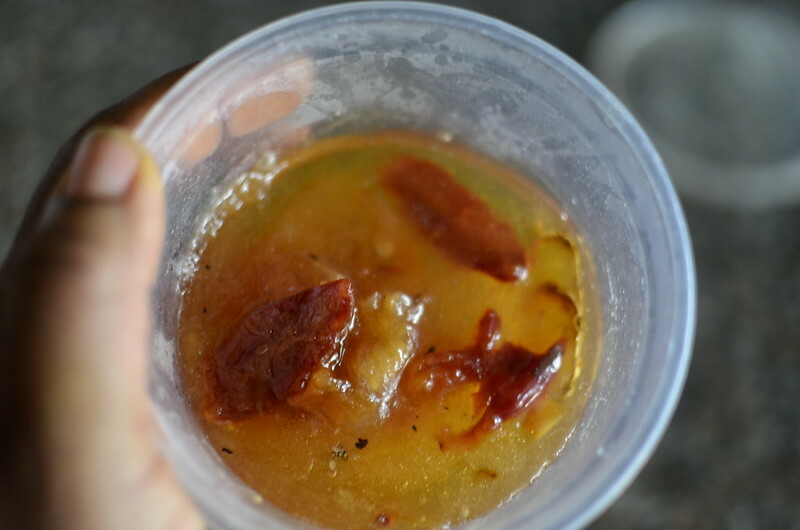 I blended some raw agbalumo flesh in my plastic blender and ended up with agbalumo latex lining the inside. It took multiple soaks and days to remove most of it – but not all. 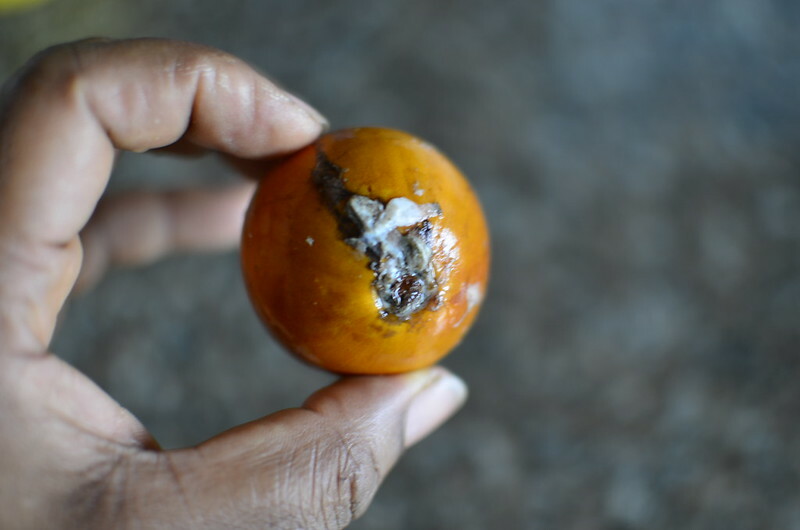 The skin of ripe agbalumo comes off easily compared with the unripe. To help, I use a table knife to grip segments of the skin to drag them off. This time, I noticed that the flesh actually nestles in the concave depression created by star-shaped cluster of seeds. You can actually peel the sheath off the seeds, using a knife. I’ve mentioned a few times just how different the sheath around the seeds is very different in texture and taste to the flesh. Though tedious, it is interesting to see this is possible and explore ways it can be used. I enjoyed them candied in a delicious mixture made by Ramon. The seeds – the sweetest part of the mixture becomes even sweeter. It is such a thrill to get a whole mass of the sweetness and chewiness of the heaths without the agony of dealing with a hundred seeds. Well 20. 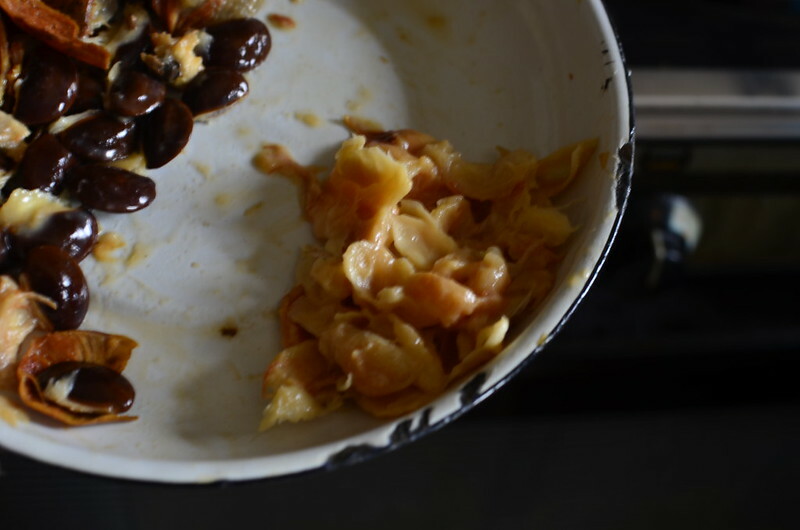 I’ve observed that cooking agbalumo tends to activate the gum-forming compounds – it was Ramon who cottoned me on to this. The next discovery occurred when I used my handheld blender to puree a mixture for a syrup (which ended up as jelly/ jam by the way). When I was done, I noticed the blades and the pin attached to the base of the blades was full of thick gum. It took considerable energy to prise the gum from the pin.